When I used to read Cosmo (like, when I had actual time to read and I needed tips on how to look “hot on a budget”—seriously, who has time for THAT?) and other magazines, I loved seeing the “What’s In My Bag” page. Typically, they’d have a celebrity share what they carried around in their hella-expensive designer purses. They almost always had the same thing: expensive perfumes you’d see in department stores, $20 lip balms, hair products that were featured on Oprah’s Favorite Things episodes, and wads of cash. 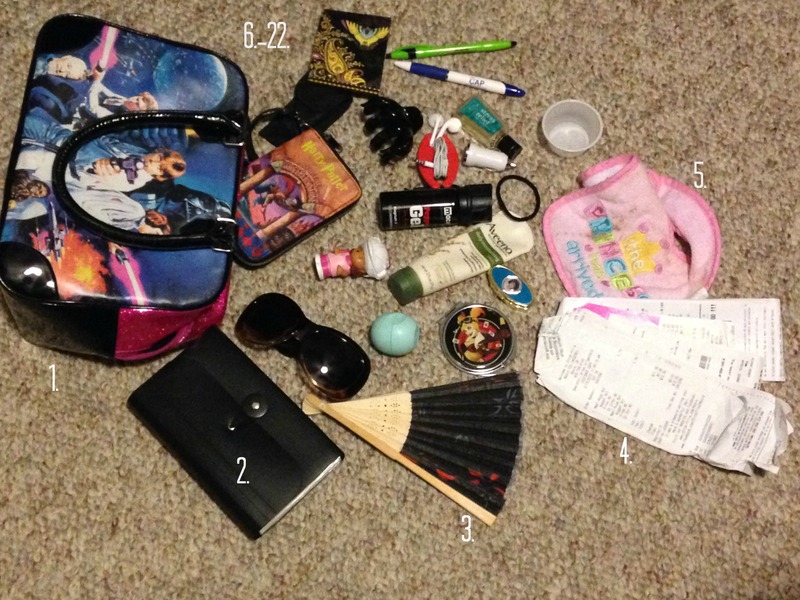 As I was cleaning out my purse (a weekly ritual I reserve for Sunday afternoons, I started to giggle, thinking about all of the things in my bag and how ridiculous it would look in a glossy magazine, compared to what’s in Beyonce’s Michael Kors tote or Kim Kardashian’s Hermes Birkin Bag. Coupon holder, organized by aisle at my fave grocery store! A fan for those “I’m-in-my-thirties-why-am-I-having-hot-flashes? !” moments. Old receipts that I haven’t thrown out yet. Mostly from Target. Because, Dollar Spot. An old, dirty bib that has been in my purse for who knows how long. through 22. : My new Harry Potter wallet, multi-use tool, notepad and pens (I HAVE to write things down or make lists because I have horrible Mommy-Brain), an empty cup from a free sample I got last week at Wal-Mart, hair clip and hair tie (because a mommy of a little one can’t wear her hair down unless she wants bald spots), hand sanitizing gel (in “Stress Relief”; because, children), iPhone car charger adapter, headphones, Mace (which I got after the break-in), Aveeno hand lotion (my hands are crazy-dry because I wash them 20 times a day), EOS lip balm (seriously, the BEST ever), a Little People figurine (because, children), my Loretta Lynn pill box my mom got me in Tennessee, a Harley Quinn compact mirror, and sunglasses (from the Dollar Spot at Target; seriously, there’s point in paying #15 for shades when your child pulls them off your face. Plus, I lose sunglasses like ten times a day). What’s in YOUR bag? Do you even carry a purse or do you shove everything in your pockets? Or maybe you use your kid’s diaper bag as a purse? Share in the comments below!